..."'I always used to have a fence. Now, finally, I broke it. I am not in exile any more’ Leonid Balaklav tells me as he points to a long wooden fence in a Chagall's painting of Vitebsk. Balaklav remembers the fence from his childhood in Moldavia, with the threatening dog in the passageways. I am thinking of Bialik's story Behind the Fence and the poles of the fence that separated between the region of the Jewish town and the new challenging world outside, in Joseph Budko's paintings. 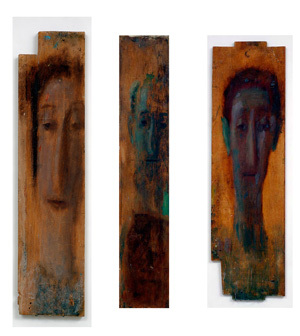 This way or another, Balaklav is dismantling the fence, and it seems that the thin planks piled up in his studio in the Gilo quarter in Jerusalem, on which he has painted more and more skinny and elongated portraits, are planks that have remained from the dismantled fence. Balaklav has set himself free". In his paintings of the 1990s, Balaklav employed light as a means of body perishment and freeing the soul (‘with this light I erase things’ he then said ). 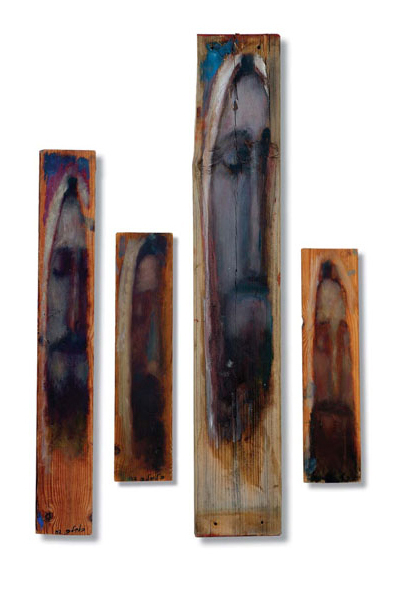 At that time, his anorectic plank paintings, too, carried portraits that looked like transparent, nearly disappearing, ghosts . In his present paintings, on canvases, planks, and cardboards – the light is not erasing things: it builds, it confirms, and it says a ‘yes’ of pious thanksgiving.